this may be the first time you see a picture of my school. However, this is not the most usual angle to see it from at all. Quite interesting, after going there for five months! My classroom is at the far right part of the (was this the name we settled on for the colour, Vegard?) dirty peach volume, on the sixth floor. The entire grey volume is empty, and will perhaps be filled up with... something in a while. 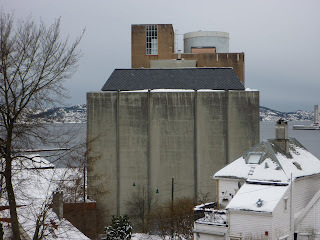 We're also discussing how the grounds of the school could be opened to the public, and in general making this old silo look more like an architect school and less like a slaughterhouse from the outside. Being a student at a school that's always changing, both physically as well as in terms of teachers and curriculum, and actually having a say in what should happen, is really one of the greatest things about going to BAS.